KIEV, Ukraine -- Opinion polls show that although the ruling Party of Regions (PRU) remains the most popular party, it may lose the parliamentary election scheduled for October 28 to the combined forces of the opposition. 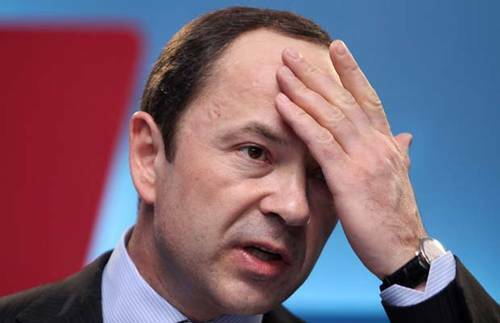 Serhy Tyhypko, former head of the liberal party Strong Ukraine and new member of the Party of Regions. Economic growth has slowed considerably of late so the ruling party cannot boast of a strong economy ahead of the election. Neither has the government managed to improve relations with Russia and the European Union, as PRU leader Viktor Yanukovych promised when he was elected president two years ago. Consequently, there is not much left Yanukovych can do to improve the party’s standing in the seven months remaining before the election. The PRU has made it clear that it will bet on populism and the elimination of rivals through enrolling them in the PRU. Yanukovych has already promised handouts to the poorest strata so his economic team is racking its brains to find the $2 billion needed for higher pensions, low mortgage rates and compensations to the depositors of the defunct Soviet state savings bank. Yanukovych’s economy adviser, Iryna Akimova, conceded recently that his social initiatives might cost even more than that while, for the moment, no more than $1.4 billion can be guaranteed. She suggested more could be raised from selling mineral extraction licenses and increasing personal income tax rate for the rich to 20 percent from the current 17 percent. Like in all of its previous election campaigns, the PRU will play the Russian language card. Speaking in an interview ahead of his visit to Moscow, excerpts from which were published by the Russian news agency ITAR-TASS on March 18, Yanukovych said Ukraine’s bilingual population was in favor of giving an official status to Russian. Several media outlets interpreted that as Yanukovych’s intention to give Russian the status of an official language on par with Ukrainian. However, he meant giving Russian the status of a regional language for areas where more than 10 percent of the population regards Russian as their mother tongue. In order to pass a law on this, Yanukovych will need only a simple majority of votes in the 450-seat unicameral legislature, which is dominated by the PRU. A state language status for Russian would require two-thirds of the votes in order to change the constitution. Considerably more than half of Ukrainians speak Russian fluently, around one third prefer Russian in everyday communication, and most newspapers come out in Russian. Yet, Russian has no official status in Ukraine. A recent opinion poll by the Kiev International Institute of Sociology has shown that 47 percent of Ukrainians are in favor of giving some status to Russian. The PRU’s traditional strongholds in eastern and southern Ukraine are Russophone, so the PRU naturally plays the language card in all elections. However, the PRU hardly does anything to raise the status of Russian once each election campaign is over, as Yanukovych’s bitter rival, Yulia Tymoshenko, sarcastically remarked on her website. Most recently, the PRU has gotten rid of a potentially strong rival party. Deputy Prime Minister Serhy Tyhypko disbanded his liberal party Strong Ukraine (SU), called on its members to join the PRU and did so himself at the PRU congress on March 17. Tyhypko was elected deputy to the party’s chairman, Mykola Azarov, who is also the prime minister. It has been rumored that Tyhypko, who came in third after Yanukovych and Tymoshenko in the 2010 presidential election with 13 percent of the vote, may eventually replace Azarov in both positions. Tyhypko himself told journalists at the congress that he would not mind becoming the PRU leader. Thanks to taking over SU, the PRU may gain additional percentage points in the October parliamentary election. The popular approval rating of SU, which targeted the nascent middle class, has been hovering around 3-4 percent during the past several months, compared to the PRU’s 14-18 percent. The PRU will not stop at enrolling Tyhypko and his people. Two more small parties are expected to merge with the PRU soon said deputy ideology chief, Volodymyr Demydko, on the sidelines of the PRU congress. He added that the PRU’s strategy was to attract bright personalities who could be small party leaders while not necessarily taking over whole parties. Emergencies Minister Viktor Baloha, who chairs United Center, a small party that used to be in the camp of former President Viktor Yushchenko, has not ruled out that his party could one day merge with the PRU. Oleksandr Sin, the mayor of the large industrial town of Zaporizhya, which is one of the PRU’s strongholds, announced most recently that he would join the PRU. Sin was elected mayor in 2010 as a candidate from Tymoshenko’s Fatherland party. He left Fatherland only a month after that.